Meetings are generally scheduled for the third Saturday of each month from 12:30 PM to 3:30 PM. December's meeting is often held on the 2nd Saturday of the month to accommodate seasonal commitments. The meeting date or location may change due to holidays or scheduling conflicts. Always check the home page of this web site before setting out for a meeting, in case of last minute, unforeseen changes. Weather closures: Our OLLI-Mason hosts follow the weather emergency declarations of the Fairfax County Public School system, available here. Meetings of the Society's Board of Directors are held on the 3rd Monday of the month in Arlington. Our Annual Meeting of the Corporation and elections are held in October. More details about Board meetings are available here. PATACS holds joint meetings with the OLLI PC User Group. Unless otherwise noted, meetings will be held at the Osher Lifelong Learning Institute at George Mason University, 4210 Roberts Road, Fairfax, VA, known as the Tallwood Campus. 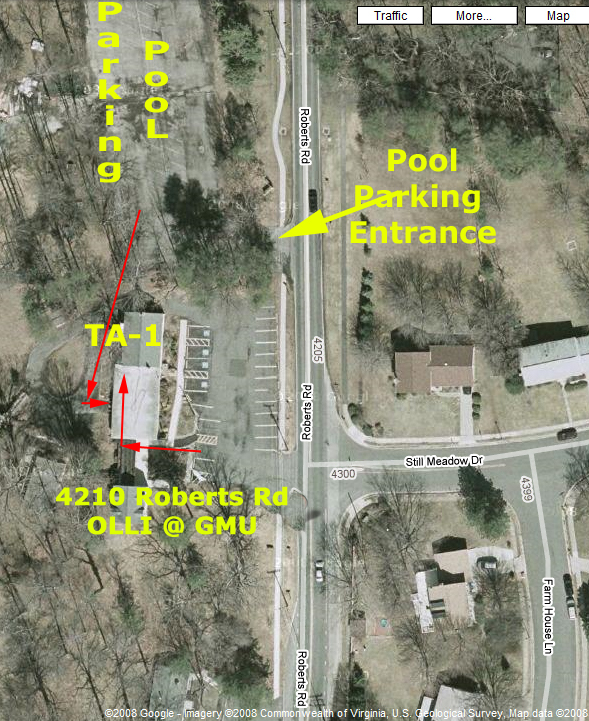 TheTallwood Campus of OLLI, located at 4210 Roberts Road, Fairfax, Virginia can only be accessed from Roberts Road - it is not directly accessible from within the main GMU campus. Note that Roberts Road runs in a North-South direction between Little River Turnpike (Route 236) and Braddock Road. Be careful approaching Tallwood from the South because the hill obstructs the view of oncoming traffic. Parking at Tallwood. There is parking in the front and rear of Tallwood, including several spaces restricted to vehicles with handicapped licenses or tags. Additional parking is available in the swimming pool parking lot immediately to the right as you face Tallwood (i.e., directly North of Tallwood). If both of these lots are full, you may park on Forest Avenue, the first street beyond the swimming pool lot (i.e., North of the lot) or on Still Meadow Drive, and Farm House Lane, directly across the street from Tallwood (i.e., East of Tallwood). Please be respectful of residents' driveways and mailbox access. The latest freely distributable software for GNU/Linux Intel based computers will be available on disk for a nominal fee before the meeting (12:30 - 1:00 pm) by contacting linux@patacs.org. For more information on PATACS meetings and events, call the PATACS AnswerLine (voice) at (703) 370-7649. You can also leave messages and questions for the Board of Directors. tablets, smartphones, consumer electronics, and digital photography. For more information, call the PATACS AnswerLine at (703) 370-7649.